An in-depth analysis of why the Dopamine Deficit Theory of Addiction does not explain Addiction, craving and relapse. In the next week or so I will be critiquing a theory of addiction that has become common currency out there in internet land, which I find disturbing. 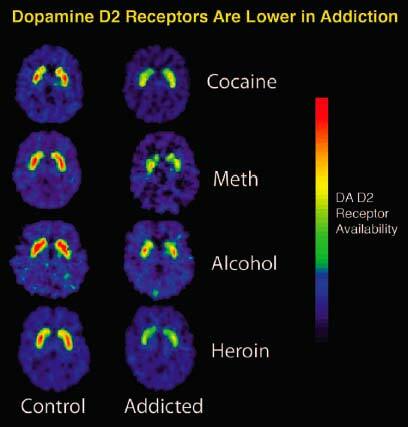 It seems to have become widely accepted that the cause of addiction is a deficit in the neurotransmitter dopamine. More recent conceptualisations now also add to this, a reduced ability of the conscious, prefrontal cortex part of the brain to control behaviour also. So there is a pathological need for reward, mixed with an impaired ability to control that seeking of reward. This theory of addiction is one proposed by Nora Volkow the current Director of NIDA which suggests people are addicted because they do not have enough dopamine. In Volkow’s conceptualisation of addiction there is no mention of stress systems which often are dysregulated as the result of childhood maltreatment of one sort of the other. Although the vast majority of addicted people have had childhood maltreatment? This dysregulation of stress systems appears to initially heighten dopamine activity so that reward sensitivity is usually exaggerated and use of substances or behaviours appears to more reinforcing, i.e. it not only exaggerates the rewarding aspects of substances but it is also “extra rewarding” because it may alleviate negative emotional states. So it is positively and negatively reinforcing at the same time in effect. There is no mention of how this stress system in the abusing phase of addiction lowers dopamine production while increasing stress chemicals in the brain. There is no mention of how these stress chemicals appear to activate “drug” memory and motivation circuits, both implicated in urges, craving and relapse. How these stress chemicals ultimately activate compulsive responding. There is no mention of how this stress dysregulation leads to compulsive addictive behaviours – behaviours are compulsive because they are behaviours one is compelled to do in order to alleviate distress. Equally stress systems also incidentally not only produce the dopamine deficit that Volkow’s theories of addiction centre, but they also greatly impair prefrontal control of behaviour, which is also integral to her theory. In fact, chronic stress impairs the brain and behaviour so profoundly that in the post mortem brains of alcoholics there is prefrontal cortex atrophy and dorsal striatum hypertrophy which in simple terms means that behaviour has progressively moved from being conscious and evaluated to unconscious and automatic, i.e. it has become compulsive. Dopamine is also implicated in dorsal striatal response. We are not saying dopamine does not have a crucial role to play in addiction, we are saying that it is not the whole story. It might not even be half the story? We are saying that dopamine networks are impacted upon increasingly during the addiction cycle by stress chemicals. It is stress that reduces behavioural repertoires to such an extent that behaviour becomes limited to a responding to distress – this is how free self will is diminished – not sole by dopaminergic means. Stress not only heightens reward, it provokes impulsive behaviours which lead to maladaptive decision making, the combination of which initiate and maintain initial drug use. It also creates the emotional distress that addicted individuals often seek to escape from. It also contributes to the alexithymia and lack of emotion awareness that creates the emotion processing deficit that leads to the distress based impulsivity (negative urgency) that creates the need to rashly act to resolve distress often via maladaptive addictive behaviours. All of which Volkow seems to ignore. There is also no mention of oxytocin which may be integral to addiction via an insecure attachment pathomechanism. Oxytocin also modulates dopamine production and stress reactivity in the brain. It may be part of the neurobiological “hole in the soul” that the vast majority of addicted people describe. NE, for example, heightens dopaminergic incentive salience? Whereas dopamine seems to be more important for reward, NE seem more important in relapse etc. Why does Volkow not consider the role of NE more fully? Volkow has co-authored papers with researchers like George Koob who is one of the leading experts on stress systems in addiction but none of this seems to have filtered through to public consciousness. And this is damaging we believe. People relapse because they are in some distress in most cases so why not mention this? Especially when she mention the role of distress in addiction in this article? Distress is the product of a dysregulated NE system? In the next week or so I will illustrate how a limited focus on dopamine gives a distorted view of addiction, craving and relapse. For example, dopaminergic cue reactivity, i.e. the idea people relapse because of a heightened attentional bias to drug related cues only accounts for a small minority of relapse and usually when accompanied by stress/distress? The negative emotions and emotional distress of interpersonal relationships accounts for more relapse than cue reactivity. So why spend millions of this type of research paradigm when it does not do what science ought to do, which is to predict behaviour? This is the most damning criticism of Volkow’s ideas on addiction, they do match up with experience, reality, they do not predict behaviour? They appear to have little ecological validity? I believe the answer to addiction is in this statement – it is stress/distress that creates compulsive behaviours – NE is one of these “stress chemicals” which she overlooks. I will hope to show why this is the case in later blogs. To me, this is not treating a disease of addiction, it is simply prolonging the agony. It is quite worrying the Director of the NIDA thinks this is treatment and recovery for addictive behaviours. It is little wonder there is such a gap between mutual help groups that have been successful in “treating” addiction and science based “treatments” which appear to have limited insight into the reality of addiction and why people become addicted and why they relapse. These recovery groups are successful because they treat the stress and emotion dysregulation at the heart of addictive behaviour. They treat the inherent emotion processing deficits which prompt compulsive behaviours. They treat the distress at the heart of addiction. They change neurobiology by changing behaviours -they tried drugs before so it would seem another chemical straightkjacket is not what they need. Suggestion to Nora Volkow, find out what works in recovery and then attempt to explain why? It is called the neuroscience of recovery. I am not sure any theory of addiction ever helped an addict recover? 1. Weinshenker, D., & Schroeder, J. P. (2007). There and back again: a tale of norepinephrine and drug addiction. Neuropsychopharmacology, 32(7), 1433-1451.